Implant supported dentures have many advantages compared to traditional dentures. They can be the perfect choice if you are concerned about the complications that come with wearing typical dentures, which can include limiting certain foods, being afraid that they may fall out, and having to remove them every night for cleaning. Dr. Hovden provides implant supported dentures, which makes these worries a thing of the past. 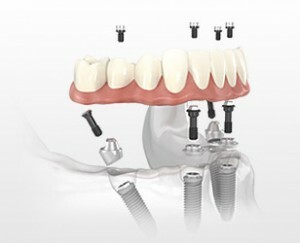 The implant supported denture procedure involves placing four implants. Patients love this procedure’s convenience. You can gain all the great benefits of implant-supported dentures in just one day. Implant supported dentures require a slightly more involved procedure, but the benefits you receive as opposed to a regular denture are tremendous. Many people have opted for implant supported dentures to improve the quality of their oral health care and more importantly … their daily lives. Easy Care: No need to hassle with removing your dentures to clean them, which can be extremely inconvenient. With the implant supported denture procedure, caring for your health is similar to the everyday routine you would follow to care for your natural teeth. Fixed to Implants: Because your dentures are fixed to dental implants, you don’t have to worry about embarrassing situations when regular dentures may fall out. Implant supported dentures give you peace of mind when talking with friends and family. Normalize Eating: One of the biggest problems with traditional dentures is the inability to eat the foods you love. Implant supported dentures allow you to eat normally, including those foods that can be difficult to chew. Beautifying: Not only does implant supported dentures have many obvious every day benefits … they also strengthen and enhance your smile, giving you a beautiful new look. Call us today in Daly City to find out how implant supported dentures can improve your oral health and simplify your life if you are in the South San Francisco area, including Pacifica! Dr. Hovden and his staff also offer traditional dentistry services, along with sleep apnea solutions and porcelain veneers!